Sounds awesome! Have you got a link? 5 minutes of Googling returned nothing. It was on the OTF on their custom thread, but it's lost to the void. I just can't remember who made them. Surprising turn of events, the good old Pheyden Standard was the color for the wave, or when used on other figures, Hybrid colors. I change my guess. Well, at this point now that figure has been reviled, it almost feels like cheating, but in my mind there is no doubt who this character is. It's a Repoclaimer Soldier, reconfigured into a "Standing" form. I'm interested in seeing what the torso looks like before the head. One main question I have is are we going to have the larger singular chest piece like the Travelers, Buildmen, Armorvors, and Nobotos, or are we doing multi piece torsos like the Glyans and Phaseons? 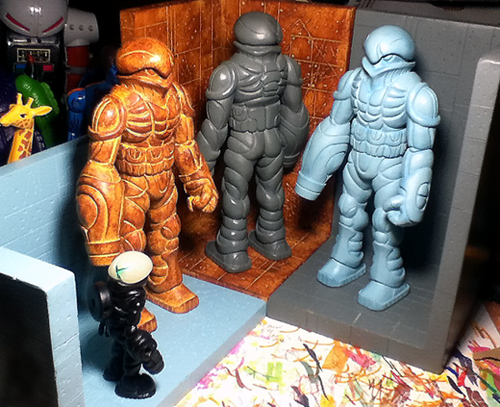 The thing that pushed me to start collecting Glyos is also my favorite piece of Glyos lore. Sure we aren't going top to bottom and this isn't the upper leg? Perfect way to build suspense to reveal the character when what we want is the head. Ahh, crapbaskets. I under shot my estimate by a week. There goes my bet.